Lancia got mad. The poor results of the Thema, Voyager and Flavia lead the brand to increase the rebates and offer them at incredible prices. According to the brand’s new official website, the promotion applies only for Italian territory, and goes until June 30th. Prices start at 24.900 euros for the Flavia, 29.900 euros for the Thema, and 31.900 euros for the Voyager. Definitely these are big discounts that allow more people to access to this big American cars, and is supposed to help Lancia to increase its registrations in upper segments. Notice that by the time of their launch, in November 2011 and June 2012 (the Flavia), they were priced at 41.400 euros for the Thema, 39.900 for the Voyager, and 37.900 euros for the Flavia. Regardless the fact that this is a big promotion and Lancia may catch new clients, the truth is that the brand is desperate about the poor results of its American models, and in my opinion, it is doing very bad. 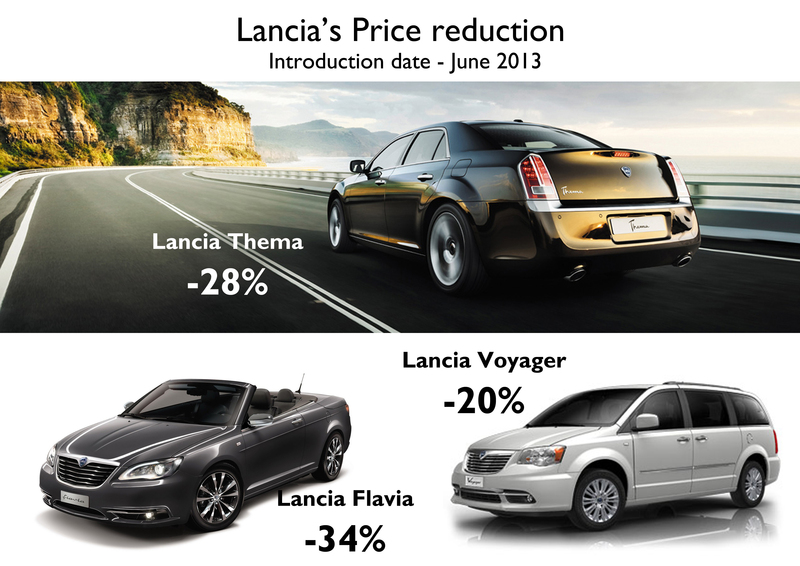 By reducing the prices of its flagships, Lancia is affecting the poor image of its luxury cars by positioning them in one segment below, and at the same time it is telling its current clients that they lost around 10.000 euros by buying its cars. How could anyone buy a car that will be priced 10.000 euros less in the coming months? if the brand doesn’t value its own cars, who is going to do it? it’s good to be active in terms of promotions and visibility, but a brand like Lancia, which doesn’t have the best image, can’t ruin the reputation among its clients. This might be the beginning of the end for this weird operation of Chrysler’s products rebadge, which will welcome a totally new product plan with models made by Chrysler and Lancia taking into account American and European customers. 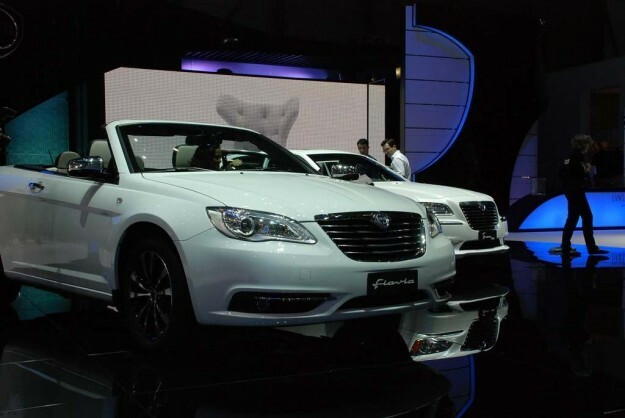 The new Chrysler 200/Lancia Flavia is going to be the first step. ← Jeep Compass or Nissan Rogue/Qashqai? Buen punto de vista. No había considerado que el precio por mantener su poca cuota de mercado rebajándose afecta la imágen de marca y aumenta la depreciación. Lancia Flavia, Thema and Voyager: BEST BUY! ‘The final blow* are rather harsh words for the current situation, but you give an accurate assessment of Lancia’s biggest problem. You just can’t fool Europeans selling American Iron with Italian names. Even the next generation Flavia (as good as it may be) will need to differentiate itself significantly from its American twin if it’s to have any chance at succeeding. It’s a global market now, and everyone will perceive it as a rebadged Chrysler -not good for Lancia’s image. I still think the solution is to bring the Chrysler marque back to Europe, and make Lancia into a sport-premium Fiat line, much as Citroen has done with it’s DS line. Classic Bob, I think you are right. Chrysler back in Europe. Lancia could become a stiylish-design Fiat line, as Citroen has done with DS line. Abarth is already a sport line. Lancia will de a stilish-design line. It seems desperation has set in. Lancia is in an unenviable situation of a long neglected and shrinking brand. A brand that had greatness in the past, but steadily devalued by management over the years. However I feel that Lancia is too valuable a potential asset to shut down. The way I see it, Alfa Romeo will compete with BMW and Audi lower cars while Maserati will compete at a higher level. However Lancia can be positioned to take on Mercedes lower cars. It will require a huge investment in new models and dealer network and will only be attempted after Alfa Romeo is sorted if at all. I don’t think Chrysler will come back to the EU since Marchionne has said that only Alfa and Jeep are the truly global brands. Making stylish design Fiat will kill the brand even faster as it will become just a high spec badge like the Citroen DS series. Lancia has too much valuable heritage for that. Anyway in the future Fiats or Chryslers will more or less be the same car. The small cars more Fiat and the large cars more Chrysler, but there will be a lot in common, so it makes sense to develop new Lancia models with Chryslers as the base for large cars and Fiat as the base for small cars. The incentives might be the only way to keep the score-board ticking and hold minimum viable market share until the new models arrive. 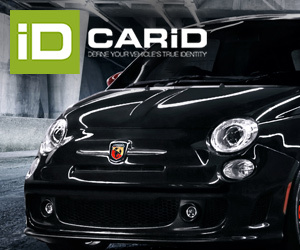 At the moment Fiat has a collection of regional brands. Fiat brand is closest to being global, as it’s least dependent on Europe, and Jeep is next (though still 75% in North America). The others have minimal sales outside their home markets. Whether or not the brands have global potential, they won’t get there until Marchionne is willing to invest in new product. Lancia brand is dead. Better sell it to a competitor who needs a premium brand (Renault?). And reintroducing Chrysler in continental Europe. Actually today Lancias are Chrysler rebadged and everyone know this. Bring back the Chrysler merge to Europe!